The modern education of Arabs started in the nineteenth century. Exposure to the West through foreign visits, translations, and personal interactions had created a new generation in the Arab world who expressed their deep concern for the state of affairs pertaining to economy and development in their own countries. In this respect, journals and literary circles played a very important role. 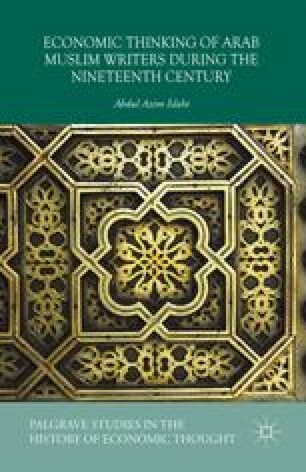 In the present chapter, we aim to study the economic thinking of some famous educated and intelligent Arabs who enjoyed literature and expressed their ideas through novels and journals, in this way trying to create economic awakening among their readers. As usual, they were not economic thinkers in the normal sense, but rather played an important role in the economic thinking of subsequent years. In this connection we have chosen three personalities — Ali Mubarak, ʿAbd-Allāh Nadim, and ʿAbd al-Raḥmān al-Kawakibi — as the focus of our attention. Mubarak had, for some time, been a government minister. The other two were rebellious against the government and preferred to remain in the opposition camps. However, their common property was as men of literature.